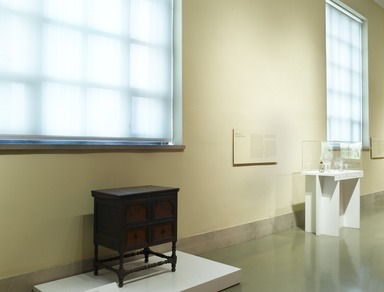 The Jan Martense Schenck House represents the oldest architecture in the Museum’s period room collection. 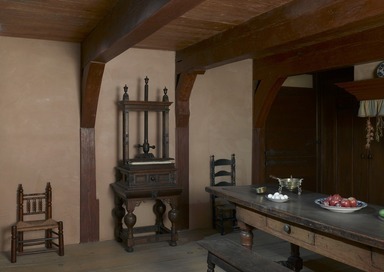 It is also the most complex of the period rooms in terms of reconstruction and interpretation. The house originally stood in the town of Flatlands, one of six rural towns that were to become the borough of Brooklyn. Established under the Dutch colony of New Netherlands, which became the English colony of New York in 1664, Flatlands was first called New Amersfoort, after Amersfoort in the Netherlands. The area was originally inhabited by the Carnarsie Indians. A kitchen was added at a right angle to the house probably in the late 1790s. In the early nineteenth century a porch with four columns was also added. Finally, sometime about 1900, dormer windows were installed above the porch. The interior of the house was also changed. The large central chimney was removed, probably about the same time as the kitchen wing was added, and new chimneys and fireplaces were built on the outer walls. 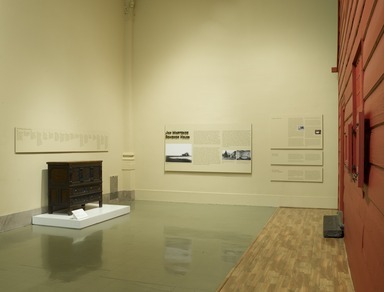 Old photographs of the interior of the house on site in Flatlands show it with early twentieth century wallpapers and an assortment of nineteenth-century furniture, all of which was discarded when the house came to the Museum. During the 275 years that the house stood in its original location, it underwent many changes to accommodate the needs and tastes of new generations. 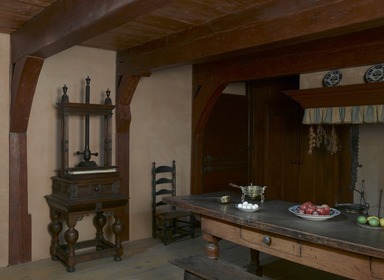 The Museum’s curators might have chosen to exhibit and interpret the house to any point in its long history, but they wanted to add an early Dutch colonial house to the series of existing period rooms, thereby chronologically pushing back the survey of American interiors. This necessitated stripping away later additions and changes, such as the kitchen wing and porch, to rediscover the original two-room structure. 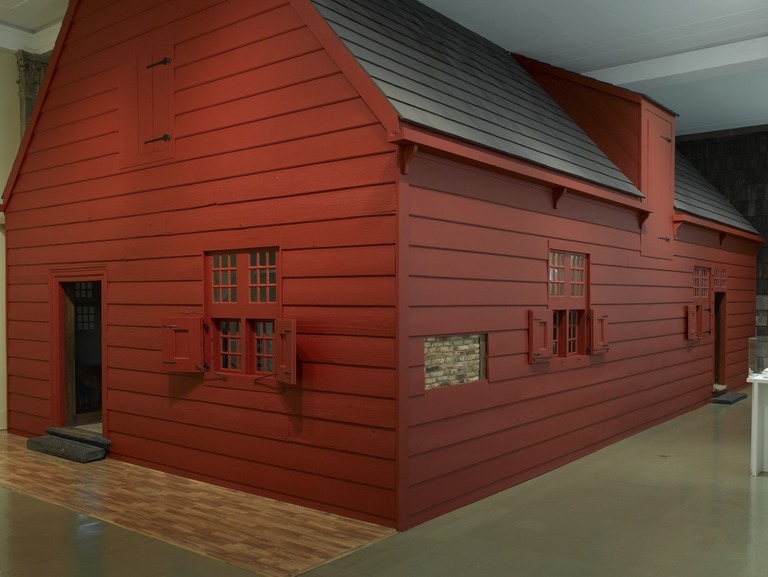 The present reconstruction is based on careful analysis of surviving original elements and other surviving Dutch colonial houses. About 1730, when Martin Schenck, Jan’s eldest son, owned the house, it underwent several changes to accommodate his growing family. For a long period after about 1730, the two-room core of the house changed very little, and therefore the curators chose this moment in the early eighteenth century to which to interpret the house. Of course, many conjectural decisions were made, such as the precise locations of the exterior doors and the size and locations of the windows. On the interior, the location of the staircase to the loft and the form of the large open hearths and built-in bed box also involved conjecture, but were based on historical precedent. 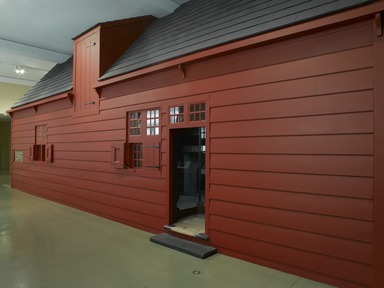 In the original Museum installation, there were two bed boxes on the exterior wall of the north room. When the house was moved to its present location in 2006, it was decided that if the house did have a bed box it more logically was on an interior wall next to the hearth as you now see it. For many years the house was painted gray. Recent analysis of the exterior paint layers on the original clapboard surviving in the corner at the short end of the building revealed that the house was originally white and then red. Since the interior of the house is interpreted to the first decades of the eighteenth century, we decided that the house might have received its second coat of paint, the red layer, by that time. If you look carefully, you will notice that some of the horizontal clapboards on the end at the house have a rough surface and others seem smooth. 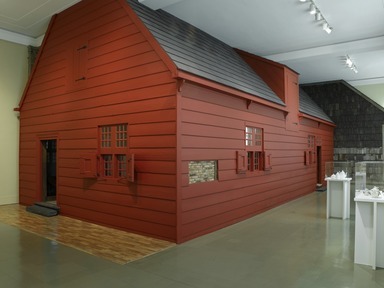 The rough boards are the part of the original siding applied to the house in 1675–77 that were salvaged when the house was dismantled in 1952. Part of the exterior clapboard siding has been removed here to show a reconstruction of the brick nogging originally used to insulate the house. Henry Hudson, sailing for the Dutch, explores the east coast of North America, looking for a passage to Asia. He trades with indigenous peoples such as the Canarsie. The Dutch West India Company is established to trade in West Africa and the Americas. The Dutch establish the town of New Amsterdam on the island of Manna-hata (Manhattan), as part of the colony of New Netherland. The western Long Island village of Breuckelen, named for a town in the Netherlands, is founded. It will eventually join with five other towns— Bushwick, Flatbush, Flatlands, Gravesend, and New Utrecht—to become the borough of Brooklyn. The ten-year-old Dutch boy Jan Martense Schenck arrives in New Amsterdam with his brother Roeloff and is sister Anetje. The Dutch relinquish the colony of New Netherland to the English, and New Amsterdam becomes New York. Jan Martense Schenck marries Jannetje van Voorhees. Surviving children born between 1673 and 1685 include Jannetjie, Martin, Willemtjie, Neeltjie, and Stephen. Jan Martense Schenck purchases Mill Island (now known as Mill Basin) in the town of Flatlands, along with a half share in the island’s tidal gristmill. He builds a house there by 1677. Jan Martense Schenck dies and leaves his house, mill, and farm to his son Martin. His son Stephen inherits a parcel of land nearby in an area now known as Canarsie. Martin Schenck renovates his father’s house, living there with his wife, Cornelia van Wesselen, and his son, John. Stephen Schenck dies and leaves his parcel of land in Canarsie to his son Nicholas. Nicholas Schenck (Jan Martense Schenck’s grandson) builds a house in Canarsie. His first wife, Willemtje Wyckoff, dies in 1779; his second wife is named Jane. The Schenck children include Nicholas, Jr.; John; Anna; Adriana; Nelly; and a fourth daughter. The Battle of Long Island, the largest battle in the American Revolution (1775–83), is fought in Brooklyn. Regimental orders from 1781 document Captain Nicholas Schenck’s leadership of local militia. Great Britain recognizes the independence of the United States. Census records show twelve people in Nicholas Schenck’s household, including two enslaved Africans. Nicholas Schenck, Jr. (Jan Martense Schenck’s greatgrandson) inherits his father’s house, remodels it, and lives there with his wife, Alletta Remsen, and their children, Jane, Abraham, Stephen, James, and Anthony. The household includes two servants, one of whom is an enslaved ten-yearold African American child named Peter. Jane Schenck, Nicholas Schenck, Jr.’s, daughter and Jan Martense Schenck’s great-great granddaughter, tells in her journal of a British ship chasing an American ship off a nearby beach during the War of 1812. Following the opening of the Erie Canal, New York is poised for tremendous growth. The population of the six towns that will eventually join to become the borough of Brooklyn is still primarily of Dutch and English descent. There are also people of other European backgrounds and a sizeable number of enslaved and free Africans. The Schenck family owned the house for three generations, finally selling it in 1784. Beginning in the 1920s, as real-estate development increased, a number of preservation plans that might have maintained the house on site were put forward but were never realized. Finally in 1952, the Brooklyn Museum made a commitment to save the house, dismantled it, and stored it for about ten years until plans to install it in the Museum were finalized. The house was opened to the public in 1964.
Who Were the Schencks’ Neighbors? called a roemer, or “rummer,” and is a typical form found in northern Europe in the seventeenth and eighteenth centuries. The large size of this vessel suggests that it was used communally and passed about the table. There is a selection of smaller, individual roemers inside the Jan Martense Schenck house. In the last quarter of the seventeenth century, an English glassmaker and merchant named George Ravenscroft (1632–1683) invented and patented a new formula for entirely colorless glass. The large covered goblet seen here is typical of his first efforts with the new formula but still exhibits the elaborate silhouette of the Venetian style. The smaller drinking vessels illustrate the new, simpler style of glass in the last quarter of the seventeenth century. With simple V-shaped cups, sturdy stems, and pronounced knops, or spherical ornaments, the glassware is simple in design and strikingly modern in appearance. 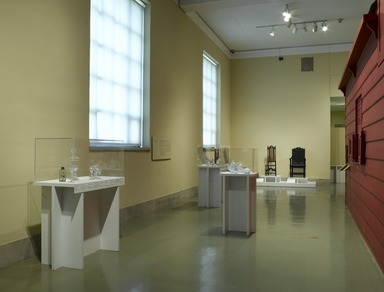 It also finds parallels in the bold turnings seen on many of the chairs of the same period displayed in this gallery. In the seventeenth century, many of the media that we take for granted, such as silver and ceramics, had very different social and economic meanings than they have today. Others, such as pewter, that are rarely used today were far more common. Pewter was, in fact, the most common material for many objects of daily use; the Schencks probably ate off pewter plates. You will notice many other everyday pewter objects in the Jan Martence Schenck House. Silver objects, owned in quantity only by the well-todo, had importance beyond their usefulness and beauty; since they were made of the same material as money, they also provided a means of storing and displaying wealth. The silver spoon and salt displayed here were made entirely by hand. During the Industrial Revolution, not only did silver become a more available natural resource, and therefore less valuable, but advances in manufacturing made it less expensive and available to a wider audience as well. For example, the decorative band on the silver teapot was made by machine and more easily reproduced than the hand-hammered, or repousée, work on the salt. The secret of porcelain making was unknown to Europeans until it was deciphered in the Meissen factory, in Germany, about 1709. Before then, porcelain objects were either imported from Asia or made of soft-paste porcelain, an imitative formula composed mostly of white clay and ground glass. The small teapot is a rare and early example of English soft-paste porcelain. The diminutive size of the pot also suggests the exclusivity of tea consumption at that time. Compare it with the larger earthenware, machine-produced teapot made about seventy-five years later.